Oooh boy. This new season of Anne with an E is testing my love, to be sure. If the last episode of the second season was 90% off book, this one was 95% off book. It’s almost as if creator Moira Walley Beckett has created a ten-part fan fiction of Anne of Green Gables! Or at least, looking at it that way helps me appreciate it more. It’s got me thinking: Wasn’t “Road to Avonlea” really off the books too? Also, the “Little House on the Prairie” TV series was WAAAYYYY off the books. And I should know as I just visited Walnut Grove, Minnesota on the banks of Plum Creek! Please chime in if you have an opinion. 1. Gilbert and Bash are in Bash’s home country–Trinidad–where they encounter Bash’s mother, a slave, and some stark racism. Gilbert realizes he isn’t in Avonlea anymore. 2. Ugh! There’s that greasy grifter, Nate, convincing Anne she’s looking at real gold through a microscope. Meanwhile, she’s as snookered as anyone else in town, except for maybe Matthew, who is starting to have his doubts. 3. Then Dunlop, the good cop of the two grifters, makes his move, offering to pay for Matthew and Marilla’s gold extraction from his “inheritance.” But Matthew’s eyes are wary. 4. Cole is introduced as a new character, a sensitive, artistic boy whose magnificent sketches draw the ire of both Mr. CREEPER Phillips and Prissy Andrew’s oaf of a brother. 5. Anne terrifies the Story Club (from the book!) with a chilling tale and sends them scurrying home in a fright. Then a red fox appears–Anne’s Patronus or her spirit animal? By the way, Prince Edward Island is home to tons of red foxes. I love the way the show worked that in. 6. I didn’t think it was possible for Diana’s parents to be worse, but they are truly appalling, money-grubbing snobs. In the book, Mr, Barry was benign enough, to be sure, but here he is loathsome. In this show, he’s even worse than his wife, on my Crap List forever for banning Anne after the Raspberry Cordial debacle. But I digress. The Barry’s host a gathering of Avonlea denizens to talk about the gold. Little do they know this “gold” ain’t worth a plug nickel as my dad used to say. 7. Geraldine James’ Marilla is such a nuanced actor. You totally believe she is hopelessly awkward and uncertain in social situations, and you cringe for her. You cringe some more when you overhear Nate tell another lady she is a “bright, shiny penny,” recycling the same tired compliment he gave Marilla earlier, a remark which sent our dear lady into a tizzy of three hairstyle changes for the Barry gathering. 8. Minnie Mae, you GO! Score one for Minnie Mae, who, upon spotting Nate trying to pocket a silver item on her family’s mantle, kicks him right in the shins (shoulda been in the whirlygigs!). Was it the Ipecac Syrup or the onion poultice? Either way, MM is fierce. “One day you may regret the license you give your imagination, Anne,” says Mother Marilla. “You must try and remember what’s real and good.” AMEN! 10. RH Thompson just melts my heart as dear Bachelor Cuthbert. He wants to be on the safe side and forego the gold testing so Green Gables won’t be torn up. “I want us to give the farm to Anne,” he tells an agreeable Marilla. This show may be all over the place as far as the plot of Anne of Green Gables is concerned, but instances like these fill in the qualities that make us love the characters. The way Matthew lightly strokes Anne’s forehead and tells her “You’re safe here, I promise,” is perfectly him. 11: Matthew is also fatherly to his farmhand, Jerry, played wonderfully by French Canadian actor Aymeric Jett Montaz. Our Matthew notices everything the rest of humanity misses. He notices that Anne is teaching Jerry to read, and fishes her old chalkboard slate out of the trash to give to Jerry for practicing his letters. In gestures small and big, Matthew loves his people steadfastly. What do YOU think? Can an Anne fan fall in love with this series, even if it’s wildly off-book? After all, “Little House” fans went berserk over the TV show, even though it went farther off-book than Anne with an E! 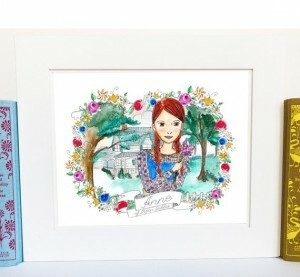 Every comment on my blog will be entered in a contest to win a fetching Anne of Green Gables art piece from my favorite Etsy shop, Carrot Top Paper Shop! So comment away, won’t you, Anne Internet Friends?? I’m not certain how I feel about the subtle storyline with Marilla being fluttery over the slimeball grifter. It seems like she would have too much common sense and practicality to let herself be affected by that. OK, Lorilee! Your blog had me laughing out loud. Whirlygigs? Anne walking in a coma? Brilliant humor and insights. Yes, we imaginative creatures need common sense too!